Serves 4 . Preparation time 10 minutes. Cooking time 40 minutes. • Put the stampkoring, bay leaves and salt in a pot with enough water to cover the wheat. Cook for about 40 minutes or until soft. Strain and remove the bay leaves. • Use a balloon whisk to combine the honey, lemon juice and salt. Add the olive oil in a thin stream while you whisk. Add the parsley. • Transfer the lukewarm stampkoring to a bowl and add the olives, marjoram and olive oil. 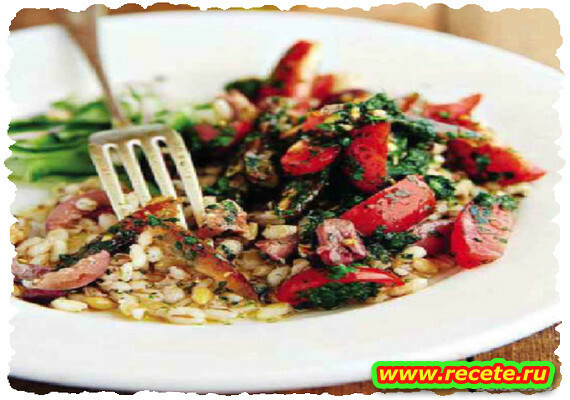 • In a separate bowl, pour the salad dressing over the tomatoes and dates and set aside for half an hour. Spoon the tomato mixture over the stampkoring just before serving.